I'm pretty sure this falls under this category, in fact it's rather a combination of the two, and if it does, I am genuinely surprised and a little bit disappointed in you Homestuck fandom. How was this thread not already here? 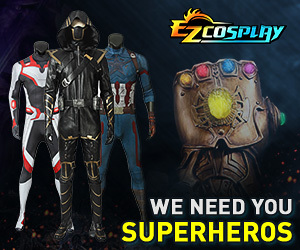 I would think we'd be all over this site by now, being the cosplay cockroaches we are. Pretty much everywhere, nigh indestructible, hell, Hussie already proved that a Homestuck fan can survive an average of about five thousand pages after loosing their head.... plus apparently, like cockroaches you seem to be all over the place until someone turns the light on to look for you, and then you scatter into the woodwork. So basically, Homestuck cosplay, this is a thread for it, maybe draw some of our people out of the shadows to commune with their brethren. Have at it! Hm. I guess I never thought to look. DARN ME AND MY LAZINESS!!! Actually I was about to make one to ask about conventions that would be appropriate to dress up as homestuck characters since I've done my research from unreliable sources and would possibly like to dress up as someone in the future. Also for those who don't know where to look. Then again, I may be over reacting since I've never done this kind of stuff before. [QUOTE=Pyro_Queen;5013311]Hm. I guess I never thought to look. Meh, as far as that topic goes, I guess it just isn't a huge deal. There's a pretty big Homestuck "population" at my local anime convention, hell, there's even a little event based around it, and a lot of anime cons have Homestuck cosplayers so I guess it's pretty open. The days of panicking and trying to kick out Homestuck cosplayers have sort of passed by now I think. I saw this kinda late before going to a small convention in my state and HOLY MOTHER OF MIRACLES HALF THE CONVENTION WAS HOMESTUCKS. It was an anime convention too. Then again it may have also been anime/comic but that shows how much I read into something. [QUOTE=Pyro_Queen;5014458]I saw this kinda late before going to a small convention in my state and HOLY MOTHER OF MIRACLES HALF THE CONVENTION WAS HOMESTUCKS. It was an anime convention too. Then again it may have also been anime/comic but that shows how much I read into something. Cosplay/convention overlap is really common, and the Homestuck community may as well have a freaking patent on that bizz. No matter what sort of convention you're hosting, I can say with almost absolute certainty, that there will be Homestucks. Since you've got Sakuracon in your plans, I'll let you know it was rife with Homestucks a few years ago. I think it died down a bit last year, but with this being its final year (I think? I don't read it) it may pick up again. There's probably a group for it on Facebook for sure since it's one of the larger fandoms and they generally do huge photoshoots outside. Just please don't do any characters with obnoxious horns or yelling or whatever. My first Sakuracon didn't give me the greatest first impression of Homestucks. [QUOTE=Scunosi;5014793]Since you've got Sakuracon in your plans, I'll let you know it was rife with Homestucks a few years ago. I think it died down a bit last year, but with this being its final year (I think? I don't read it) it may pick up again. There's probably a group for it on Facebook for sure since it's one of the larger fandoms and they generally do huge photoshoots outside.